I have been on full swing mode for statement necklace lately and I wonder why, must be the hormones, I have always been fan of fine, tiny and delicate jewelry until recently, could it be the increase of testosterone level in my body? Just kiddin'! So I have pinned quite a number of statement necklaces on Pinterest and finally decided to blog about this one that I've bumped into in Etsy. Etsy is still the best, after all, though it no longer is the place I used to know, as in, boy have you not seen many claimed to be handmade's mass-produced products in there? Can't blame Etsy, really, with the change of policy (as in now you could be the designer that produces your line of designs in volume then sell "your's" products in Etsy, it really helped the economy, like for few folds. Back to this statement necklace I've found, it's 100% handmade as far as I know, haha. 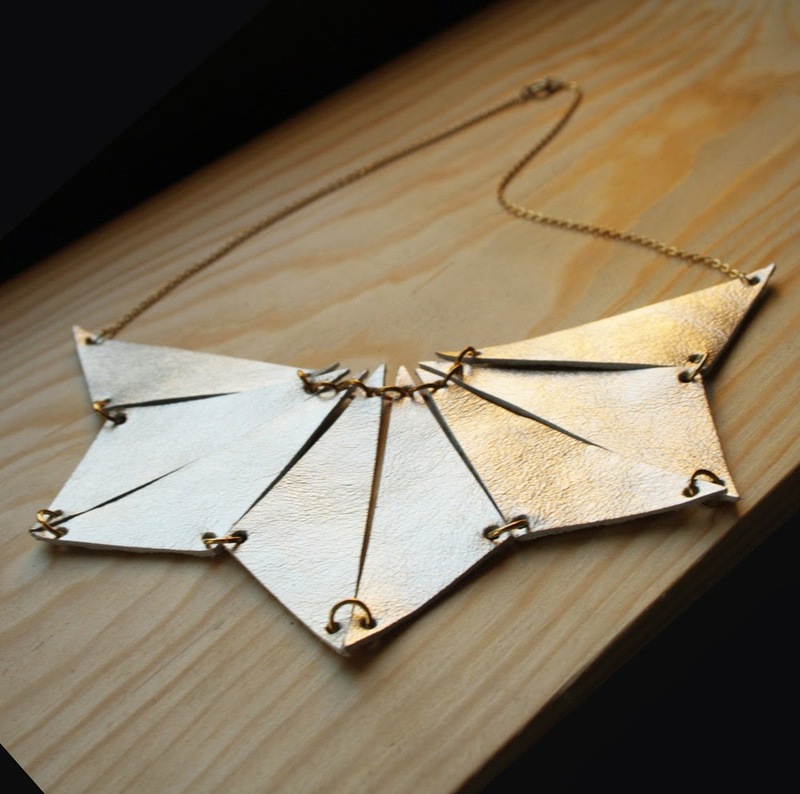 Anat from SchickiMickis made this statement necklace with a geometrical triangle design, made of ivory gold leather triangles which form a strong geometric "fan" or "sun" shape. Side note - it's so hard to keep calm and continue to handmade jewelry these days, this is the whole reason why I have been treasure hunting in Etsy for genuine handmade jewelry and to promote their work. Pin their pin-worthy works to support handmade will ya? Thank you very much!